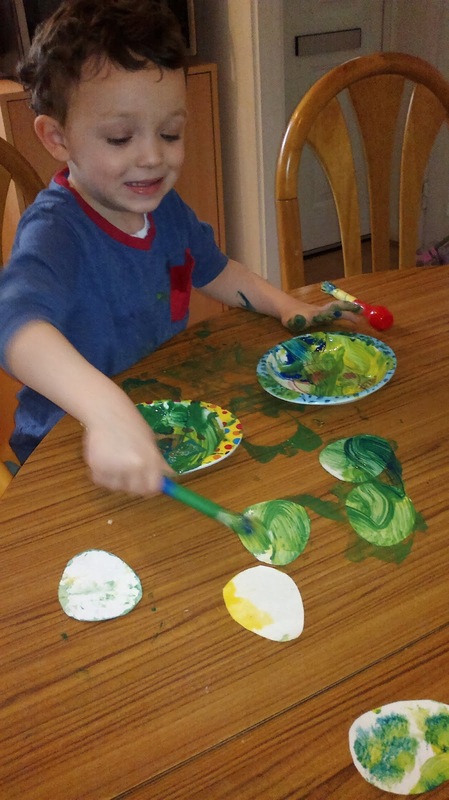 With the boys chickenpox flowing seamlessly into coughs and fevers, there have been a lot of indoor crafts activities on the books during the last few weeks. Today, inspired by a suggestion by the lovely Natalie, we started making wool cage Easter eggs, but more on that in a couple of days when our handiwork has dried and I can photograph the finished articles. 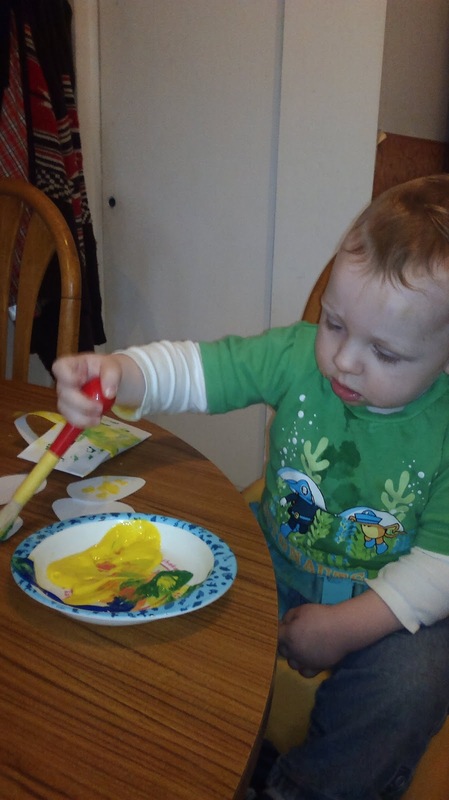 Following on in the Easter theme, we then painted card egg shapes and basic baskets (simply made by folding an A5 piece of card, sticking the edges with double sided tape and adding a card handle). When the eggs and baskets were dry, I distributed the eggs around the living room for an Easter egg hunt, with pots of bubbles to blow for prizes. I know it's all really early, but Ollie loves playing treasure hunt so the promise of an egg hunt seemed a good bribe to get him to eat up his dinner relatively quickly. The boys (including big kid husband) really enjoyed the hunt, and it was incredibly cute watching Toby toddling around with his little basket grasped firmly in his fist. We had four encores, with the final one being me hunting for eggs that Ollie had hidden. Ollie spectacularly doesn't understand hide and seek or treasure hunt games, so I got a lot of help 'It's over there mummy, I put one there on the sofa! '.